A fashion designer is responsible for creating the specific look of individual garments-including a garment's shape, color, fabric, trimmings, and other aspects of the whole. 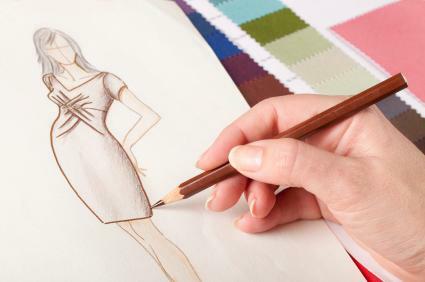 The fashion designer begins with an idea of how a garment should look, turns that idea into a design (such as a sketch), and specifies how that design should be made into an actual piece of clothing by other workers (from patternmakers to finishers). The category of fashion designer includes people at different levels of the fashion business, from well-known couturiers, to anonymous designers working for commercial ready-to-wear houses, to stylists who might make only small modifications in existing designs. Fashion designers hold a special place in the world. Their talent and vision not only play a major role in how people look, but they have also made important contributions to the cultural and social environment. Charles Frederick Worth is considered the father of haute couture. An Englishman, he opened his couture house in Paris in 1846. Along with Worth, the Callot sisters, Jeanne Paquin, Jacques Doucet, and Jeanne Lanvin are considered to be among the first modern fashion designers, as compared with the dressmakers of earlier generations. Paris was the center of international fashion for more than one hundred years, with French couturiers setting the trends for Europe and the Western world. But the position of Paris as the undisputed leader of fashion was disrupted by World War II. During that war, with Paris occupied by the Nazis, American designers and manufacturers were cut off from the fashion leadership of Paris. As a result, American designers began to receive more serious recognition. Claire McCardell, known as the creator of the "American Look," drew some of her inspiration from the vernacular clothing of industrial and rural workers as inspiration. Other American designers such as Hattie Carnegie, Vera Maxwell, Bonnie Cashin, Anne Klein, and Tina Leser had flourishing careers; they helped shape the development of sportswear that reflected the casual American lifestyle. In the postwar economy, as fashion became big business, the role of the designer changed. Increasingly, especially in the United States, fashion designers worked closely with store buyers to identify customers' preferences and lifestyle needs. Customer demographics influenced designers to create fashions targeted to specific customer profiles. Through sales events known as "trunk shows," designers traveled to stores with their latest collection in a trunk. This simple and inexpensive marketing technique allowed customers to preview and respond to the designer's new collection, and to buy clothes. Bill Blass was one of many designers who used trunk shows to gain customers, profits, and a growing reputation. From the 1950s through the 1980s, the design room in the United States became the equivalent of the European atelier. With a staff of assistant designers, sketchers, patternmakers, drapers, finishers, and sample makers, American designers worked in their design rooms to create a collection each season. "First samples" were produced in the design room and later shown in a fashion show or in the company showroom. Design rooms are extremely costly to maintain and have been downsized due to the fact that most manufacturing is now done offshore. In the early 2000s, most designers work with an assistant and a technical designer to create tech packs. A tech pack contains a designer's original idea, which is then resketched by the technical designer whose responsibility is to detail all garment specifications and construction information. Tech packs are sent directly to factories in China, Hong Kong, India, or other countries where labor costs are low and where, increasingly, first samples are made and production takes place. As the apparel industry grew, fashion schools were established to train designers and other industry professionals. Design schools in New York City include Parsons (1896) and Fashion Institute of Technology, or FIT (1944). These schools train students in specializations like children's wear, sportswear, evening wear, knitwear, intimate apparel, and activewear, for both the men's and women's market. Design schools have been established in Paris, London, Antwerp, and throughout Italy. Some American institutions have partnerships with other design schools in China, India, and elsewhere around the world. Although designers in the twenty-first century are to some extent still responsible for creating trends, the notion of designers dictating fashion has been replaced with lifestyle designing. Each season, designers follow a process of identifying trends and searching for inspiration, researching fabrics and colors. They then focus on creating a collection that will appeal to their specific target customers' lifestyle. Although fashion trends continue to emanate from Europe, many designers look to the street for inspiration. Fashion designers, working in tandem with the film and music industries, have launched or helped popularize such fashion trends as mod, punk, grunge, hip-hop, and cholo. Fashion designers are both creators and trend trackers. Much of what they now design is a response to street styles. Mass retailers and manufacturers enlist the services of market-research firms to predict consumers' changing tastes so as to make appropriate product. Fashion designers utilize data for design purposes that is collected from focus groups and consumer behavior studies. The business of fashion has morphed into the science of fashion. Designers in the twenty-first century are beginning to adopt new technologies such as body-scanning for custom fit, along with seamless and whole garment knitting technologies, which can manufacture garments with the push of a button. Both are forerunners in a movement toward automation that will once again revolutionize the fashion industry. Just as the sewing machine changed the face of fashion in the past, technology will change it in the future. Designers of the future, as they have in the past, will continue to serve their customer's needs but will do so utilizing new resources and tools. To create new product lines, designers in the future will utilize high-tech textiles, including those that possess healing, sun protection, and other unique qualities. Designing clothes in the future may have more to do with function than with fancy, in response to new consumer demands and preferences. See also Callot Sisters; Color in Dress; Fashion Advertising; Haute Couture; Ready-To-Wear; Charles Frederick Worth. Baudot, Francois. Fashion: The Twentieth Century. New York: Universe Publishing, 1999. Frings Stephens, Gini. Fashion: From Concept to Consumer. 7th ed. Englewood Cliffs, N.J.: Prentice-Hall, 2001. Payne, Blanche, Jane Farrell-Beck, and Geitel Winaker. The History of Costume. 2nd ed. New York: Harper Collins, 1992.